Desserts are usually a big part of any holidays but I find Christmas season naturally goes with festive and pretty desserts. From decorative cookies to barks to yummy yule log cake and so on. Believe it or not, I love baking and making treats but I am usually satisfied with one or two bites. Except a few things. And this saltine toffee is one of the exceptions! 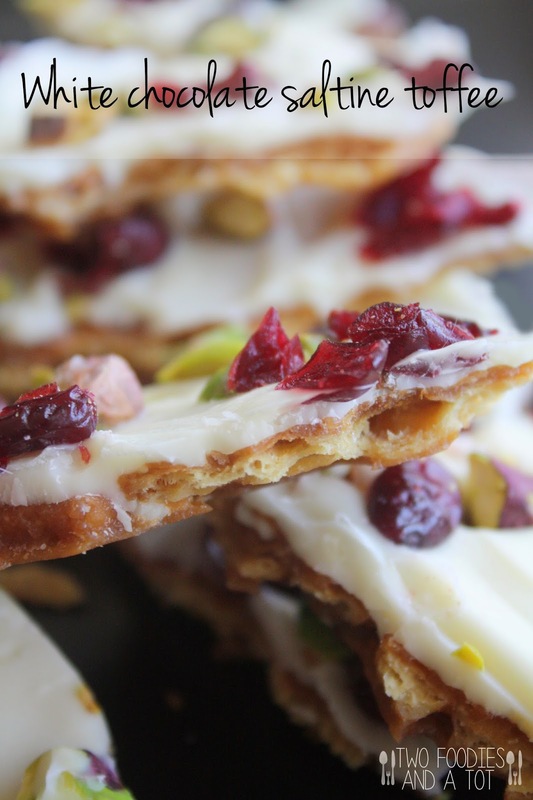 Slight saltiness from saltine and the nuttiness from toffee layer topped with chocolate, pistachio and cranberries.. My gosh, it is so addictive! Even the color is so festive and fits right in for the holidays. White, red and green. So pretty. I am a huge fan of dark chocolate and I've always done dark chocolate versions but my mom who loves white chocolate made me try with the white chocolate once and I fell in love with it because of how pretty it looks. 1. Preheat the oven to 400F. Line a rimmed baking sheet with parchment paper and arrange the saltines in a single layer. 2. In a sauce pan, melt the butter and brown sugar together and bring it to a boil on a medium high heat for 3 minutes or until it has caramel color. 3. Pour the hot mixture over the saltines and bake it for 5-6 minutes or until bubbly. 4. Take the baking sheet out and sprinkle chocolate chips on top and wait for a few minutes for chips to start to melt and spread it evenly. I sometimes pop the pan back in the oven with the heat off so chocolate melts quicker with remaining heat - in this case just 1-2 minutes will do. 5. 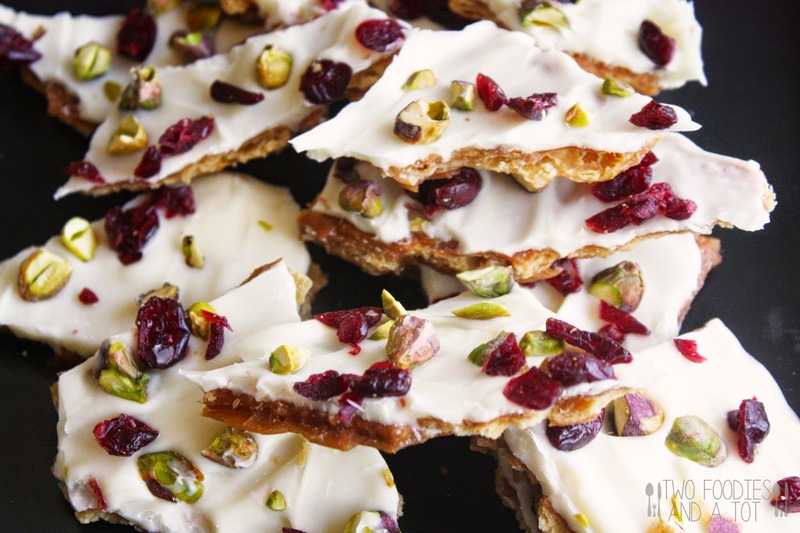 Sprinkle pistachio and dried cranberries. Put it in the fridge until firm and break it apart.